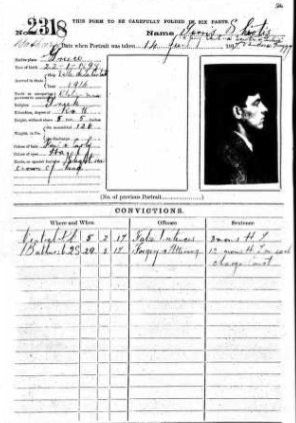 Ancestry.com has a database online that is titled - NEW SOUTH WALES, AUSTRALIA, GAOL DESCRIPTION AND ENTRANCE BOOKS, 1818-1930 which includes 102 people who listed Greece as their place of birth. This collection of gaol description and entrance books from prisons in New South Wales contain two different, but similar, records. The first were kept before the New South Wales government required record keeping. These include records from both Sydney and Darlinghurst gaols (Sydney held prisoners until 1841, when they were transferred to the new gaol at Darlinghurst), as well as Albury (1861–1867), Berrima (1840–1847), Goldburn (1848–1867), Maitland (1860–1867), and Newcastle (1840–1859). This collection also contains a few volumes that are indexes to entrance or description books.